Whether you're in a relationship with another person or focusing on self-love at this time, you are being invited to 'detach' and reflect on how things are going. The key is to be neutral - to act as an unattached observer. Only by stepping back from automatic (egoic) reactions and personal feelings can you take a more balanced overview. Traditionally called 'Justice', card 11 is about clarity, fairness, and facing up to what you have done. If things aren't working out as you might like, how have you contributed to that? What can you do differently, now that you have the benefit of hindsight? The illustration shows a release - it's also time to consider what you need to let go of. This might be an outdated thought or belief, or perhaps an old grievance you've been holding onto for too long. By accepting your part in the way things have turned out, and taking responsibility for that, you can also let go of the burden of any guilt, or blame, and move forward in a more loving way. The second card also popped out of the deck as I made my 'one-card' draw and it feels important for me to talk about this. The Heart Chakra (Anahata) represents unconditional love, empathy and forgiveness and is believed to link body, mind, and soul. If you have blocks in this area it can affect ALL aspects of your life but might typically show up in your life as difficult relationships, lack of self-love or self-discipline, and in relying on others for your sense of happiness or self-worth. This advice might sound simple but it's very challenging! How can you put it into action? 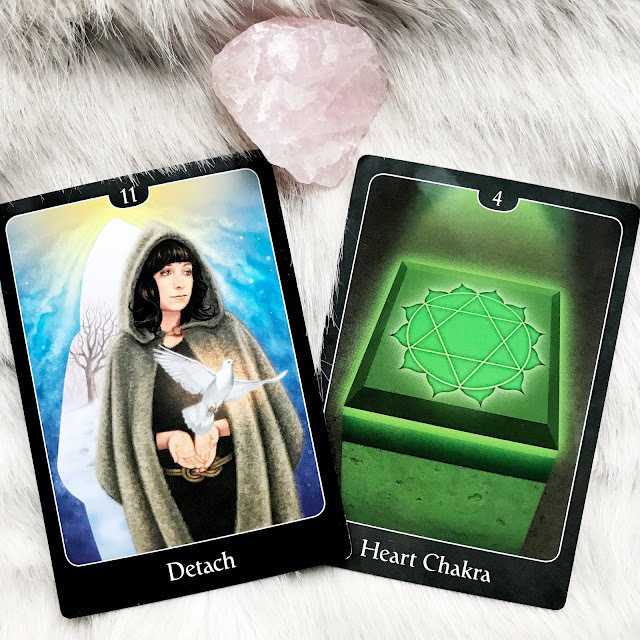 You might like to try working with Heart Chakra meditations* or using energy healing to release any blocks - I'll be focusing on this in my own Reiki practice this week!